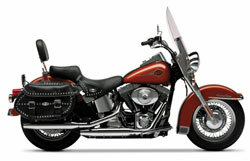 Styled to recall the past, the Heritage Softail® Classic is a bike for riders who want the comfort of a softail bike with the classic look of a 1930’s hardtail. New for 2000 is the Counterbalanced Twin Cam 88 and a detachable windshield. Taking riders back in time are features such as: a fat front fork; classic studded leather saddlebags; chrome-studded seat; full windshield; floorboards; large chrome headlamp with twin passing lamps; Fat Bob® fuel tank; and fishtail mufflers.